The Admiral is the top of the line seat from National for comfort behind the wheel. As a step up from the Commodore, the Admiral includes both swivel and heat. This seat packs a lot of value for the price. Combine luxury features with the HP suspension, backcycler, 23" cushion and 17" optional arm rests along with all standard comfort features and you have one great seat. 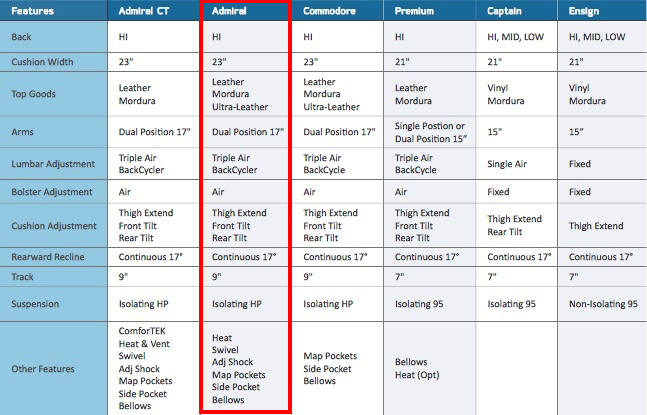 If you are looking to add air circulation to the seat, take a look at the Admiral CT. If Swivel and heat are not a priority, National offers the same great comfort in the Commodore seat. The Admiral series seats come in driver (left hand valves - right hand swivel) and passenger (left hand valves - left hand swivel). Driver side seats are model 40049 and passenger side are model 40079. Ergonomic large hi back 22" x 32"
Ergonomic large cushion 23" x 20"
18.7"- 23.7" Mid Ride: 21.2"
Heat comes standard and back cycler saves my back on long drives. This is a great seat and configure it as you wish. Arrived in great condition straight from the factory. Thank you Seat Specialists! National Premium 2000 (choose your options) - NOT available after January 1, 2018!